Seven Sparrows - 30" x 22"
A Pile of Mice - 30" x 22"
Gray Wolves - 30" x 22"
“ We have lived our lives by the assumption that what was good for us would be good for the world. We have been wrong. We must change our lives so that it will be possible to live by the contrary assumption that what is good for the world will be good for us. INOPIA encompasses a small selection of species who have been identified as endangered or extinct in Minnesota and Wisconsin. 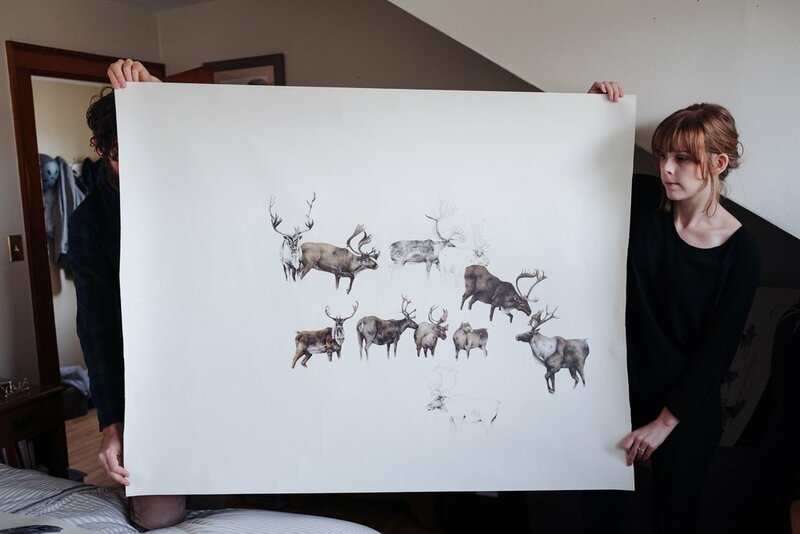 Created for the Natural Heritage Project and her Solo Exhibition in 2017, Sarah Nelson has worked to capture the emotions of coming to know the beauty of something while simultaneously watching it disappear. It is both a collection intended to document their existence as well as the interdependency that exists among various species and their habitats. The technique and style emulates that of illustrators who accompanied explorers throughout history documenting new species. At that time it was to celebrate a new discovery, it seemed appropriate to return the reference by means of remembering/commemorating a species. Though her work mirrors that of a traditional method, each work was created with a relatively new medium: pen and markers on paper, some works are up to 6 feet tall. INOPIA is an invitation to better know the rich world of this region’s natural heritage. FOR PURCHASING INQUIRIES please contact me.